It’s something we all do daily. Take our clothes off. But if you’re anything like me there is no way you’d take that daily task and do it onstage. It would be far from entertaining, incredibly uncoordinated and it would do no justice to the long history of Burlesque. Thankfully, here in Australia we have some world class Burlesque dancers who have perfected the art of the strip tease and performance. One of these people is Miss Kelly Ann Doll. Starting as a swing dancer, she has spent the last ten years performing around Australia and the world! Watching her performances is exhilarating and exhausting as she combines the fast moves of swing dancing into her Burlesque routine. It was a swing dance performance in a burlesque club that first opened her eyes to the world of Burlesque and Miss Kelly Ann Doll was instantly intrigued. While at first she thought being short and petite would work against her in the Burlesque world, she then came up with her own style and has wowed audience since the first time she took the pasties, took her top off and then vomited back stage. But wile preaching the fun of being in this industry, Miss Kelly Ann Doll doesn’t shy away from telling you how hard you have to work to make it in this industry. She said Australia rates highly in the world of Burlesque and that as performers start travelling overseas and competing with the best of the best each performer is putting Australia on the map. Miss Kelly Ann Doll was also one of the first Burlesque dancers to perform in Jakarta and Singapore. These were big performances for burlesque when it come to suppression and what was allowed in these countries and has allowed burlesque to truly go global. As well as performing, Miss Kelly Ann Doll mentors other new dancers and plans events right around the country including the Sydney Burlesque Gala Festival . 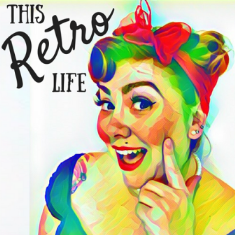 You can meet Miss Kelly Ann Doll and hear her story in Episode Four of This Retro Life. And check out some of her incredible videos online if you can’t get to see her live like this one! It’s amazing.